With some builders you can know a model is their work by simply looking at it. Their models display some, usually indefinable, characteristic that tells the world who built them. With Irvin's models, that characteristic is known as the "Arter Rake". Whether he's building a street machine, muscle car, hot rod, or custom, Irvin always starts by setting the rake. He then builds the model around the way it will sit. 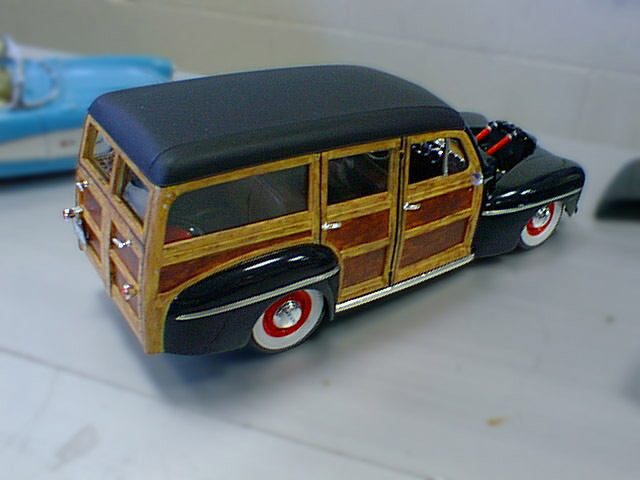 This woody is no exception. Irvin's first task was setting the rake, which included lowering the car all the way around. Irvin usually spends a good bit of time selecting just the right wheels and tires to give his cars the "look" he's after. This time, instead of exotic aftermarket wheels and high-tech tires, he found that the factory-issue rolling stock was exactly what he needed. He hand painted the kit whitewall tires and sprayed the steelies in hot rod red.